Stoneware (Siegburg style), relief, 1.75L, pewter lid. The centrally depicted Charlemagne (Carolus) was King of the Franks from 768 and the first Holy Roman Emperor from 800 until his death in 814. His kingdom incorporated much of Western and Central Europe. 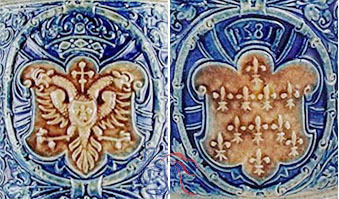 The double-headed eagle shown in the uppermost arms was the heraldic symbol of the Holy Roman Emperor. The two heads, first seen in HRE heraldry circa 1250, represent church and state. The lower arms, dated 1581, most likely belonged to a member of the House of Habsburg, one of the most important royal families in Europe and the source of Holy Roman Emperors from 1438 through 1740 (see arms details below).